George Herbert Walker Bush "Bush41" (1989-1993) died Friday in Houston. He was the last American president to be an Episcopalian, a line which stretches back to George Washington. In all, 11 presidents have been practicing Episcopalians. At his death, George Bush was the oldest living American president at 94 years and 171 days. Other presidents who lived to be in their 90s include: John Adams (90); Herbert Hoover (90); Ronald Reagan (93); Gerald Ford (93); and Jimmy Carter (94). Former President Carter (1977-1981) is still living and is only 110 days younger than Bush-41. Both men were born in 1924; Bush on June 12 and Carter on October 1. George H.W. Bush (Bush-41) is not to be confused with Bush-42, his son George W. Bush, who also became president. They are not the first presidential father and son to move into the White House. Adams-2 (John Adams) is the father of Adams-6 (John Q. Adams). Both the Bushes and the Adams bridged a century. Adams-2 (1797-1801) became president in the 18th century and his son, Adams-6 (1825-1829) served in the 19th century. Bush-41 (1989-1993) held office in the 20th century, while Bush-43 (2001-2009) was elected in the 21st century. Other presidential family ties include: the Harrisons and the Roosevelts. Harrison-9 (William Henry Harrison--1841) was the grandfather of Harrison-23 (Benjamin Harrison--1889-1893); and Roosevelt-32 (Franklin Roosevelt--1933-1945) was the fifth cousin of Roosevelt-26 (Theodore Roosevelt--1901-1909). FDR also married Teddy's niece and kissing cousin Eleanor Roosevelt, making her his First Lady. Although Johnson-17 (Andrew Johnson--1865-1869) and Johnson-36 (Lyndon Baines Johnson--1963-1969) had the same surname, they are not related. Both Johnsons became president at the assassination of the sitting president. Vice President Andrew Johnson became president when Abraham Lincoln (1861-1865) was assassinated at the close of the Civil War. Then nearly century later in November 1963, LBJ took the oath of office aboard Air Force One after John F. Kennedy (1961-1963) was assassinated in Texas. The US presidents who have embraced Episcopalianism include: George Washington (1787-1797); James Madison (1809-1917); James Monroe (1817-1825); William Henry Harrison (1841); John Tyler (1841-1845); Zachary Taylor (1849-1850); Franklin Pierce (1853-1857); Chester A. Arthur (1881-1885); Franklin D. Roosevelt (1933-1945); Gerald R. Ford (1974-1977); and George H.W. Bush (1989-1993). Other presidents with a passing acquaintance with The Episcopal Church include: Thomas Jefferson (1801-1809) was raised as a Colonial Anglican -- even becoming an Anglican vestryman -- but lost his faith and became a deist; Abraham Lincoln (1861-1865) was known to slip into the back pew of Washington's St. John's Episcopal Church -- the Church of Presidents -- to enjoy Evensong; Theodore Roosevelt (1901-1909) was known to occasionally attend Episcopal services with his wife, First Lady Edith Roosevelt, a church-going Episcopalian. In 1907, he helped to lay the cornerstone at the National Cathedral. His funeral was held at Christ Episcopal Church in Oyster Bay, New York; Woodrow Wilson (1913-1921), the only president buried at the National Cathedral, was interred in Bethlehem Chapel. His First Lady Edith Wilson, a staunch Episcopalian, is buried beside him at the Cathedral; Herbert Hoover (1929-1933) was a Quaker who married an Episcopalian, Lou Henry, who became Quaker for her husband. In 1964, after his death in New York City, a funeral was held at St. Bartholomew's Episcopal Church before he was transferred by funeral train to Washington, DC. for a full state funeral; and Lyndon Baines Johnson (1963-1969), a member of the Disciples of Christ, was married to Claudia "Lady Bird" Tayler at St. Mark's Episcopal Church in San Antonio. His two daughters Lynda and Luci were raised in The Episcopal Church. In 1973, LBJ's state funeral was held at the National City Christian Church. The National Cathedral peeled its bells during the presidential motorcade leaving the Disciples of Christ Church. Living presidents with loose Episcopal Church connections include: George W. Bush "Bush 43" (2001-2009), who was raised in The Episcopal Church but converted to Methodism after marrying in 1977; Barack Obama (2009-2017) attended Easter services at Washington's St. John's Episcopal Church. In 2009, he asked Bishop Vicky Gene Robinson (IX New Hampshire) to lead the invocation at the kick-off event of his first inauguration. Then, in 2013, St. John's, rector Fr. Luis Leon, was tapped to give the second inaugural benediction; and finally, although current President Donald Trump is considered to be a Presbyterian, his Episcopal ties include his wedding to First Lady Melina Trump, which was held at Bethesda-by-the-Sea Episcopal Church in Palm Beach, Florida. The First Couple's son, Barron, was also baptized at Bethesda-by-the-Sea and now attends St. Andrew's School, an Episcopal college preparatory day school in Potomac, Maryland. From 1981-1989, Bush-41 was the vice president under President Ronald Reagan. Other Episcopalian vice presidents include: Elbridge Gerry (James Madison--1813-1814); John Tyler (William Henry Harrison--1841); George Dallas (James K. Polk--1845-1849); Chester A. Arthur (James Garfield--1881); Thomas Hendricks (Grover Cleveland--1885); Henry Wallace (Franklin D. Roosevelt--1941-1945); Spiro T. Agnew (Richard Nixon--1969-1973); and Gerald R. Ford (Richard Nixon--1973-1974). As Bush's funeral unfolds, the religious aspect of the event again brings focus to The Episcopal Church -- the National Cathedral in Washington, DC; and St. Martin's Episcopal Church in Houston, Texas. For more than a century, the National Cathedral -- a great church for national purposes -- and Episcopal bishops of Washington, have long been associated with presidential funerals. The history goes back to 1901, when Episcopal Bishop Henry Yates Satterlee (I Washington) preached at President William McKinley's memorial service at St. Mark's on Capitol Hill, which served as the Diocese of Washington's cathedral until the National Cathedral could be built. In 1923, President Warren G. Harding (1921-1923) was memorialized by Bishop James Freeman (III Washington) in the new cathedral. The next year -- the year Bush-41 was born -- Bishop Freeman conducted the funeral for President Woodrow Wilson (1913-1921) at the former president's home. Following a military procession to the cathedral, Wilson was interred in rhe National Cathedral. President William Howard Taft's (1909-1913) memorial service was held in 1930, officiated by Bishop Freeman. Three years later, the memorial service for President Calvin Coolidge (1923-1929) also held at the cathedral. When President Franklin D. Roosevelt died in 1945, the National Cathedral opened for three days of continuous prayer (April 12-15) for his soul, the nation and the world during the precarious waning days of World War II. Episcopal Bishop Angus Dun (IV Washington) conducted the private funeral service at the White House before the president was taken by his funeral train to Hyde Park, New York, for burial. In 1962, First Lady Eleanor Roosevelt's memorial service was also held at the National Cathedral. The remaining Silent and early Baby-boom generations remember November 22,1963 when President John F. Kennedy (1961-1963) was slain in the streets of Dallas, Texas. Upon hearing the news of the president's assassination, the National Cathedral immediately opened and stayed open for prayer, however his state funeral Mass was held at St. Matthew's Catholic Cathedral in Washington. President Harry S Truman (1945-1953) was honored with a memorial service at the National Cathedral in 1973, then a Service of Thanksgiving was held at the Cathedral for President Richard Nixon (1969-1974) following his death in 1994. There have been three full presidential state funerals at the National Cathedral: Dwight D. Eisenhower (1952-1961) in 1969, where he first lay in repose in Bethlehem Chapel before lying in state at the Capitol's Rotunda; in 2004, the state funeral for Ronald Reagan (1981-1989) was conducted by bishops John Chane (VIII Washington) and Theodore Eastman (XII Maryland); and, in 2007, Gerald R. Ford was laid to rest. Bishop Chane was the presider and Fr. Robert Certain, rector of St. Margret's Episcopal Church in Palm Desert, California was the preacher. The Fords were members of St. Margret's and the former president lay in repose at the California church on December 26-29, 2006, before being transported to Washington on December 30, 2006 for the formal state funeral on January 2, 2007. One other president -- Bush-41 -- will also have a state funeral at the National Cathedral. Plans are to fly President George H.W. 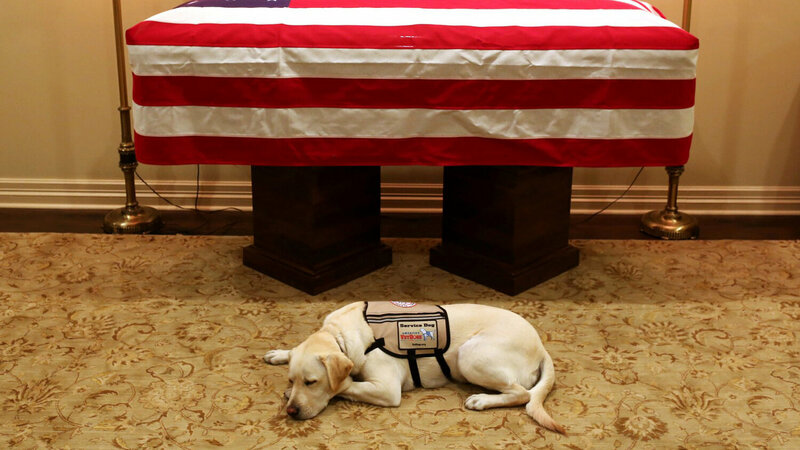 Bush's body, aboard Air Force One, to Washington on Monday (Dec. 3) afternoon, where he is to lie in state at the Capitol until Wednesday (Dec. 5). At 11 AM, the National Cathedral is to start its state funeral service based on the Burial Rite in The Episcopal Church's 1979 Book of Common Prayer. The service is to be led by Presiding Bishop Michael Curry, Presiding Bishop of the Episcopal Church. Bishop Mariann Edgar Budde (IX Washington); the Cathedral's Dean Randy Hollerith; and Fr. Russell Levenson, rector of St. Martin's Episcopal Church in Houston, Texas are to lend a hand. Fr. Levenson is the Bush-41's pastor. The Episcopal priest was on hand Friday (Nov. 30) during the waning hours of George H. W. Bush's life, to provide spiritual comfort and support to the dying former president and his gathered family. Sunday, a statement was posted on the National Cathedral's website which reads: "On Wednesday, Dec. 5, the Cathedral will host the state funeral service for President George H.W. Bush at 11 a.m. EST. At the direction of President Bush's staff, the service is invitation-only, and tickets are required. We welcome all to watch the service live on most major networks. Information about the service, the Cathedral and media accreditation is available at cathedral.org/statefuneral. Please note: The Cathedral will be closed to the public (all services and programs cancelled) from 1 PM Sunday through 10 AM Thursday." Following the service at the National Cathedral, President Bush is to be returned to Houston for another celebration of life service at St. Martin's. A posting on St. Martin's website states: "Celebrating the Life of President George H.W. Bush -- President George H.W. Bush and the late Mrs. Barbara Pierce Bush worshiped at St. Martin's for more than 50 years, and now it is our turn to show our respect and support as our congregation, as well as our nation, grieve this loss. For President Bush's funeral, St. Martin's campus will be closed Tuesday, December 4 beginning at 12:30 p.m. and will reopen Friday, December 7 at 8 a.m. All activities originally scheduled for those days will not be held." The passing of Bush-41 is big news in Houston. When not globetrotting or living in Washington, DC or summering in Kennebunkport, Maine, the Bushes made their permanent home in Houston and St. Martin's became their home parish. All the news and funeral plans surrounding George H.W. Bush's funeral has pushed the news of the Catholic Archdiocese of Galveston-Houston chancery being raided by local, state and federal law enforcement agencies off the front page. This will be the second time in less than a year that all eyes will be turned to St. Martin's for a Bush family funeral. Bush-41's bride of 73 years, First Lady Barbara Bush, had her funeral at St. Martin's in late April. Now, seven months later, the Bush family will again gather in Houston to say good bye to a parent. This time it will be their father, grandfather and great-grandfather. President Bush is expected to lay in repose overnight, Wednesday (Dec. 5) until Thursday morning (Dec. 6). St. Martin's remembrance service is slated to begin at 10 AM. Last April, the former president was very gracious when Houstonians showed up to pay their respects to Barbara Bush while she lay in repose at the large Episcopal church. Sitting in his wheelchair by the former first lady's casket, he graciously met many who came by to offer their condolences to the grieving widower. The Bushes -- George and Barbara -- were very much a part of the fabric of St. Martin's. The church was founded in 1952 and the young Bushes joined the congregation when there were only 250 members. Eventually, St. Martin's became The Episcopal Church's largest parish. Currently, the church has a baptized membership of more than 9,000 and an ASA of nearly 2,000 with a Plate & Pledge income in excess of $13 million. Both Bishop Andrew Doyle (IX Texas) and Bishop Claude Payne (VII Texas) were on hand for Barbara Bush's service. Bishop Payne was St. Martin's second rector before becoming elevated to the Bishop of Texas. Print and broadcast reporters were so impressed by what they saw as they covered Mrs. Bush's funeral at St. Martin's, they used words like "elegant in its simplicity" ... "quiet" ... "prayerful" ... "graceful" ... "majestic" ... "dignified" ... "respectful" ... "memorable" ... "powerful" ... to describe the simple Episcopal funeral rite. It can only be expected that President Bush's funeral will be just as elegant, respectful and dignified as his wife's. Following the service at St. Martin's, Bush-41 is to leave Houston for the final time. A slow-moving funeral train is to take him about 100 miles to College Station, Texas, where he is to be interred at the George Bush Presidential Library next to his wife Barbara and his young daughter Robin, who died in 1953 from leukemia.